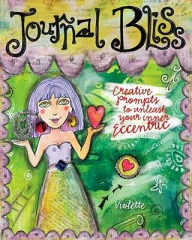 I was at the library last week in the crafting section when I picked up Journal Bliss by Violette on a whim. I've been using my journal regularly, but I want to expand on how I'm using it. Thus, I've been exploring various art journal resources both online and off. This has been my favorite so far, I'm so happy to have seen it sitting slightly askew as it was on the shelf. This book goes beyond the normal scope of the art journaling resources that I've come across so far. It's a combination of technique explanations, journal prompts, inspirational quotes, and examples from her own journal. The informal tone of the book really drew me in as well. I felt less like I was being lectured and more like I was talking about journaling with a friend (a definite plus for me). The tips themselves are solid too, from how to create borders to different techniques for image transfers. I can't wait to give them a try! Some of my favorite tips? I loved the sections on how to silence your inner critic (my personal weakness as a artist) and doodle freely. I loved a lot of her journal prompts, the way she describes them had me thinking visually from the get-go. I also can't wait to try out her techniques for creating your own fanciful lettering style as I love traditional calligraphy, but have been completely unsuccessful at it. I definitely recommend giving this book a try, particularly if you're interested in art journaling but don't know where to start (or aren't so new, but need a little encouragement). Thank you so very much for this glowing review of my book. I'm so happy you like it. I think you'll like throwing out all of the rules of calligraphy and simply creating your own. It has been so liberating for me! @Violette Thank you so much for the comment! I've been working on lettering for the past few days and I feel so liberated throwing out the rules. Hooray! I'm so happy about that! Have fun with it!